Our product range includes a wide range of vacuum autoclaves. The vacuum autoclave sterilizer is used at the very useful device in the hospitals, clinics and medical industry. These devices are made by using the advanced technology to prevent all kinds of health risks and infections due to the harmful bacteria and viruses in the medical tools and equipment. 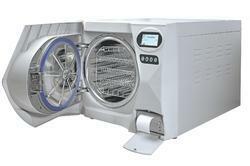 These autoclave devices also work in the same way as the steam autoclave devices. But in these devices, the vacuum pressure technology is used as an alternative to the high steam pressure in the other autoclave devices. In the market, various models of Vacuum Autoclave sterilizer are available to use in the hospitals, medical industry and other industries.